"The load of bacteria on the Tesla could be considered a biothreat, or a backup copy of life on Earth," she said Alina Alexeenko, a professor of aeronautics and astronautics at Purdue, who works in a lab that specializes in freeze-drying bacteria and biologics. The freeze-drying technology is used for long-term preservation of live virus vaccines, bacteria and biopharmaceuticals – a process similar to what live organisms experience in space. 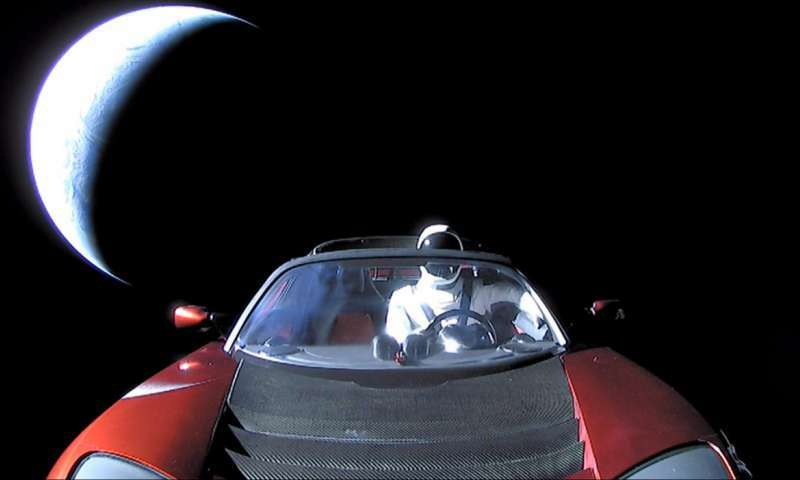 A red Tesla convertible hitched a ride to space with a SpaceX rocket in early February, bringing with it what may be the largest load of earthly bacteria to ever enter space. NASA's Office of Planetary Protection makes sure spacecraft planning to land on other planets are sterile. Much like an invasive species, organisms from Earth could thrive on another planet and wipe out native organisms. After all, it was bacteria that stopped the Martian invasion in H. G. Wells' fictional "War of the Worlds." "If there is an indigenous Mars biota, it's at risk of being contaminated by terrestrial life," said Jay Melosh, a professor of earth, atmospheric and planetary sciences at Purdue University. "Would Earth's organisms be better adapted, take over Mars and contaminate it so we don't know what indigenous Mars was like, or would they be not as well adapted as the Martian organisms? We don't know." But the Office of Planetary Protection doesn't regulate spacecraft that plan to stay in orbit; since the Tesla was never intended to land, it wasn't cleaned before takeoff. "Even if they radiated the outside, the engine would be dirty," Melosh said. "Cars aren't assembled clean. And even then, there's a big difference between clean and sterile." The Tesla could potentially land on Mars, although it's unlikely, he said. The car is in an orbit that crosses Earth's and Mars', and it will probably end up striking Earth, but it could be millions of years before that happens. Extreme temperatures, low pressure and unfiltered cosmic radiation make space an inhospitable environment for living organisms. It doesn't always kill them, though – some bacteria go dormant in the vacuum of space and wake up again when conditions are right.